Balboa is currently the top dance craze in the swing-dance world. It started its comeback a couple of decades ago during the swing revival, and has been steadily growing ever since, with weekends, competitions, workshops and events specifically devoted to Balboa springing up across the globe. Balboa is a fun, relaxed yet exciting, dancer's dance, with footwork, leading-following, and patterns that range from simple to intricate. The basics are easy to learn, yet the dance has enough depth and complexity so that dancers can progress and enjoy years of entertainment. Many songs you hear, not just at swing dances but out in the general public, are meant for balboa. So learning Balboa will greatly expand your dance repertoire, by allowing you to dance to a huge variety of music, including songs you may have previously considered undanceable. The Balboa dance got its name from Balboa Island (in the Los Angeles area) and the Balboa Pavilion where the dance originated in the 1930's. 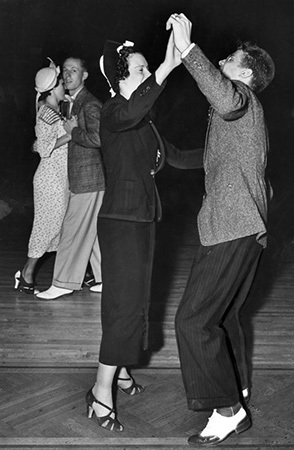 Due to the overwhelming popularity of big-band swing music, dance halls such as the Balboa Pavilion became very crowded. So dancers invented the Balboa, a dance they could dance to swing music from slow to fast (to very fast) without expending a lot of energy or taking up a lot of space. The original Balboa dancers of the 1930's passed the dance on to a new generation of dance instructors, who in turn are now teaching it to the current generation of Balboa dancers. With the contributions of modern Balboa dancers, Balboa has continued to evolve to this day. In fact, Balboa has exploded in worldwide popularity in recent years! Swing Time's Balboa classes are designed for everyone, from novices who've never danced before, to experienced dancers who've been dancing several years. There are no prerequisites, so anyone can drop in and take them. All classes stand on their own; you need not take one to take any of the others; but the more you take, the better your dancing will be! No partner is needed.